Summary: Design, Cat II Check, supply, installation and part extraction of approximately 600Te (480Te Temp and 120Te Sacrificial) steel sheet piles to form various temporary earth retaining cofferdams and temporary retaining walls. The 9No.cofferdams facilitated the excavation and construction of the proposed spring pad bases, pile caps and bridge abutments whilst the temporary retaining walls were designed to an Highways Agency " Approval In Principle" to form the temporary road diversion. 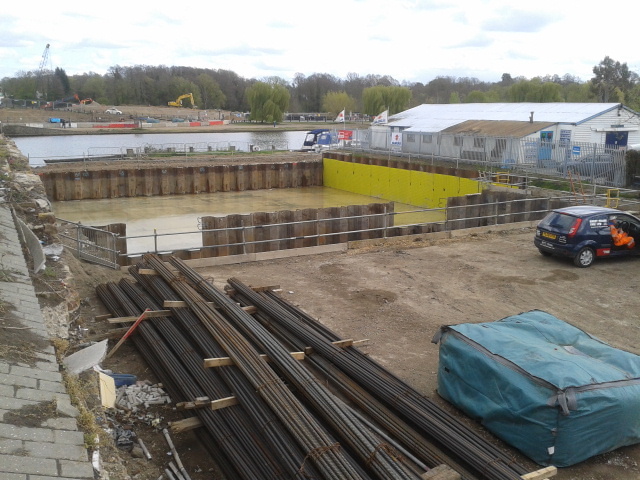 Sheet Piles ranged from 7.0m-14.0m in length retaining up to a maximum of 4.10m. The Original wooden lattice Walton Bridge was first built in 1750 and the bridge itself has been replaced on no less than 4 previous occasions. The latest bridge is the first new road bridge over the Thames in 20 years. Sheet Piling UK Ltd were employed by Costain Group PLC for the Design, Cat II Check, supply, installation and part extraction of various temporary earth retaining cofferdams and temporary retaining walls to allow excavation to a depth of up to 4.10m in cantilever such that the various RC concrete foundation bases could be constructed. Due to the proximity of the works to the River Thames all the sheet pile clutches were pre-treated with a biguma clutch sealant to assist with de-watering. The vast majority of the 600Te of sheet NSP.3W/ 4W sheet piles at 7.0 to 14.0m long were installed using an ABI Telescopic Leader Rig mounted with a high frequency MRZ800 vibro hammer. Due to the vicinity of adjacent existing structures the West Spring Pad Base and Abutment were installed and extracted using a Giken UP150 “Silent Vibration Free” pile press complete with power pack and jetting unit. The remaining temporary sheet piles were extracted using a PVE25 Vibratory hammer handled by a 50Te crane. The general soil profile consisted of Made ground over Granular River Terrace Deposits over London Clay. The cofferdams were designed assuming a full hydrostatic head of water. Where the temporary retaining walls were required to be designed to Highways approval standards the scheme specification also required that the sheet pile design calculations were independently checked by a 3rd Party organisation. This check was undertaken by Costain Group Plc in house design department.